Breakfast | Kelly and her cat. Is there anything worse than the morning? No. There is absolutely NOTHING worse than pulling yourself out of your warm bed into the cold cold world that is occasionally known as a weekday morning. I try to make my morning routine as easy as possible. I like to plan out a whole week of outfits on Sunday and I’m really trying to master the whole food prep thing. 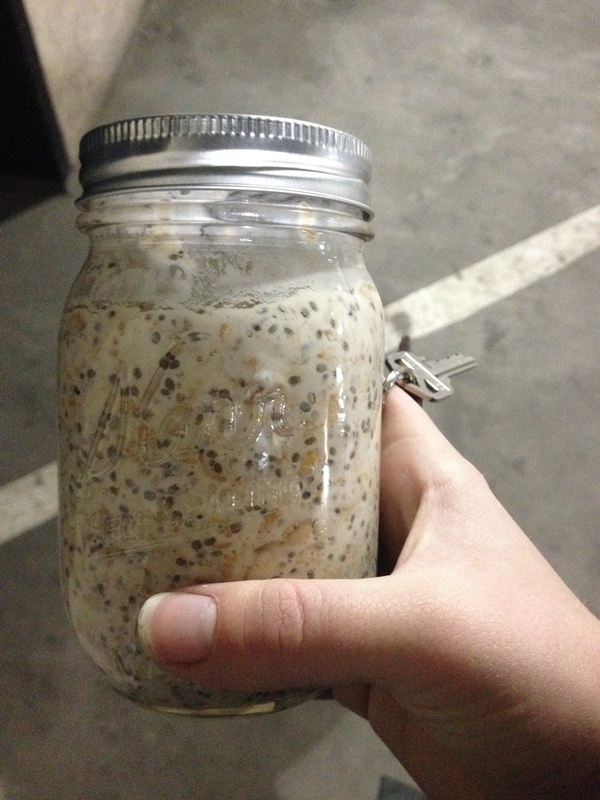 One of the easiest (and tastiest) make ahead breakfast recipes I’ve found is for overnight oats. I’ve seen about a million different varieties posted all over Pinterest, but I generally stick to something basic and reasonable. Who the hell has time for some of this stuff! Here’s my mason jar of overnight oats on my way to work last week! I usually make a couple at a time because I don’t mind if they get mushier as the time goes on. My recipe is super simple. I just toss everything into the jar and mix it up. Throw it in the fridge overnight (or for at least like 3-4 hours) and eat it COLD in the morning.. or afternoon… or late night. Whenever the mood strikes you. Potential toppings: Honey or brown sugar, frozen fruit (will unfreeze by morning), nuts… whatever sounds good or you have on hand!